Aquaman tap-dances on the edge of being unworkable so frequently that it’s really rather invigorating to witness. It is a loud film, in every perceptible way: visuals, sound design, score, narrative, casting, wardrobe. The immediate perception is of an overheated mess that lacks any sort of tonal discipline. We’re instinctively alerted toward an impending tonal disaster, a 2018 model on that type of ragged studio graft job that’s never sure of what it wants to be or when it wants to be it (basically Suicide Squad). Then it ends up pulling off the twist of never actually being as bad as it threatens to be. The movie so reliably pulls back from the precipice of failure—and in some cases pole-vaults gamely right over it, into some kind of fevered splendor—that we’re agreeable rather than put off. The title character is making his first solo appearance, after a supporting role in 2017’s Justice League. This one is another origin story, though it’s at least one that grants the insubstantial coming-of-age passages with the fleet amount of screen time they deserve rather than laboriously carving through a setup for a character we’ve already met and presumably like. Jason Momoa is Aquaman (referred to here as Arthur; the movie is in keeping with the tradition of the DC Universe films by never referring to their central characters by their superhero name), and he has superpowers but not agency; what he’s up to at the start of the film is anyone’s guess, beyond rescuing random seafarers from random pirates. This changes in short order. Arthur is a half-breed, the son of a human and a princess from the royal aquatic kingdom of Atlantis. He has a half-brother named Orm (Patrick Wilson), who has asserted himself as the heir to the throne. All well and good, except that Orm uses his ascendancy to the throne to manipulate the denizens of Atlantis and the other underwater nations into an assault on the surface world. Thus is Arthur set up to conquer Orm and reclaim what he is assured is his rightful place; to do this, he must acquire a secret weapon with the aid of the Atlantean warrior Mera (Amber Heard) and Atlantean counsel Vulko (Willem Dafoe). 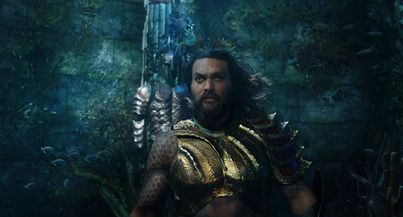 Much of the film, then, acts as a CGI-augmented oceanic travelogue with Momoa and Heard occupying most of the screen time and the other characters popping up here and there to offer quips or exposition. It is not spoiling things to note that this will eventually build toward an all-out battle between the different civilizations. I realize that I’ve spent the last paragraph and change outlining the mechanisms of Aquaman’s plot and motivations, when I could have just said “It’s a lot like Thor except better, just like Wonder Woman was a lot like Captain America but better”. The key observation here is that being better than Thor is a damn sight easier than being better than Captain America, and leaves plenty of room for the better film to still be mostly unremarkable if that’s the way it shakes out. As it is, almost nothing in this film leaves much of an impression, and it’s entirely possible to walk out of the auditorium afterward with naught but the most fleeting memories of a certain visual or line or plot development. It’s the first time that a DC film has approached the sense of overriding individual inconsequentiality that pervades the Marvel films. That perception of inconsequentiality, and its source, is also key to why I assess Aquaman positively. Both the Marvel and DC films have enlisted a broad range of directorial style for their entries, but the resulting ethos on display between the two couldn’t be more different. Where the Marvel franchise has done an immaculate job of conforming any and all of its directorial hands into a more-or-less identical overarching style, DC has more or less been developing its storytelling ethic on the fly, off the reaction to each subsequent entry in the canon. It’s true that most of the development has been inverse with each new film to the preceding one, which is arguably expected when you fast-track an entire cinematic universe and jam four movies’ worth of content into two. Still, this has permitted the individual DC films to possess something like their own directorial signature.